When it came to style Holman Williams was a talent so far ahead of his contemporaries that stable-mate Eddie Futch once said that he would rather watch Williams shadow box that watch most other fighters in the ring. 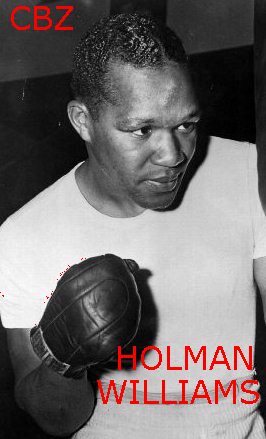 Essentially a product of the Detroit boxing gyms, where he trained with Joe Louis and Futch, Holman Williams was one of the great crop of black fighters that battled in the 1930's and 1940's. One look at his record will show that this slick boxing defensive wizard fought the best welterweights, middleweights and even light-heavyweights around at the time. Conspicuous by their absence however, as on most other records of the standout black ring men of the day, are meetings with big name white fighters. Holman Williams opposed Cerdan and LaMotta only after he had been a professional fighter for close to fourteen years, losing to both of them on points. The only fighter to beat him consistently while in his prime was the largely ignored Louis 'Cocoa' Kid who beat Williams eight times while losing only three decisions. Other great black fighters that opposed Holman Williams were Charley Burley, Jack Chase, Lloyd Marshall, Kid Tunero, Eddie Booker, Joe Carter, Bert Lytell, Aaron Wade and Archie Moore. Practically every one of these men was avoided by the higher ranked white fighters of the day, (and were mostly avoided by a certain Ray Robinson). All of these guys had to fight amongst themselves opposing each other on a regular basis just to get a payday. Williams fought the great Charley Burley seven times with three wins apiece and one no decision, (though it has been said that they fought each other more than twenty times all over the United States in cash fights), Burley was one of only three fighter to stop Williams. Besides his great talent one barrier to Williams' quest for a title may have been that Joe Louis managed him for a time, though largely ineffectively. A great asset in the gym due to his marvelous boxing skills and great sense of humor. Holman was liked by everyone he met and was a credit to the sport. After his retirement he helped in the development of young fighters in Akron, Ohio, assisting Lee Thornton. When Thornton opened the Club Wonder, Williams helped out as a weekend maintenance man. One weekend, while asleep in the club he was killed in a fire that engulfed the club.